← Letter to Kaye and Gary, 1993 . . .
Just a pretty face? 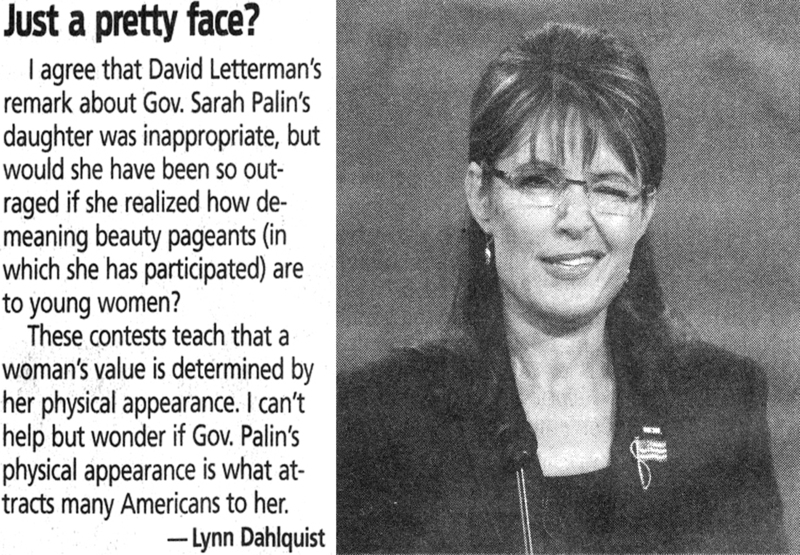 A repost of Sarah Palin . . . I did not expect the letter to be published in its entirety—my interest was only in the first two paragraphs. My so-called whining was meant to increase the odds that the letter would be published—evidently it served its purpose since you offered to publish the letter. Next month, June 2010, will mark a full year since I vowed that I would never submit another letter to the editor of the Express-News for consideration, and I have kept my vow. I must admit that I have posted several letters to the editor on Word Press, but I did not send them to the Express-News editor. I was burned—read insulted—once by that worthy, and I refuse to be insulted again. I will continue to nurse my pride and do my whining in other venues—so there!